Ok, here’s a little story made possible by Google. Let’s start off with a relatively normal web site (maybe even a blog) that describes the ordering experience of the ARMY AK-47. So far, so good. Nothing out of the ordinary. “What hit me first was the anticipated box art. 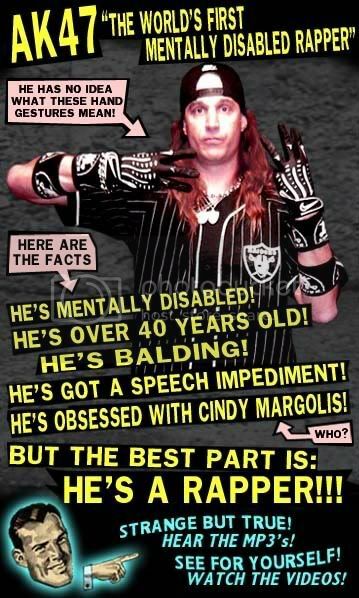 Yes, it does indeed say “The World’s First Mentally Disabled Rapper.” Now, I’ve seen some Engrish in my time, but this takes the cake. What are they even trying to tell me? The world may never know. Wow, I even got the “Laudability Package.” Usually you have to pay extra for that. You may ask yourself at this point how this could have happened. We have seen Engrish before, but are they really trying to tell us something, did they use Google translator, or did they simply Google a description for AK47 and that’s what they found? This entry was written by Chaos, posted on July 26, 2010 at 1:14 pm, filed under Random and tagged ak 47, ak47, blog, box art, disabled, Engrish, Google, greetings, guns, hello kitty, mentally, myspace, retarded, translator. Bookmark the permalink. Follow any comments here with the RSS feed for this post. Post a comment or leave a trackback: Trackback URL. The retarded one is out of stock though. Could I get this Hello Kitty one? Not sure I want a BB gun, if I order one and don’t get a retarded rapper I’ll be pissed. If you try painting my real AK-47 pink I’m going to be happy not going to be happy. I don’t know if you can get a REAL retarded rapper one. Why can’t I have my own? Get your own, just don’t paint mine! It does have a nice intimidation factor, I’m not sure if Hello Kitty would increase or decrease that. I think Hello Kitty would decrease the intimidation factor, but it would increase the humiliation factor.